The very big, the very small and the very far away: Your curious child can get closer to all of these sights with this kit, a real boredom-breaker from Levenhuk. Looking at the night sky can be inspiring for kids, and the right telescope can drive interest in science for a lifetime. But most telescopes sold in toy stores and department stores are of very poor quality. We have looked for those that will stand up to enthusiastic use! A child's age may determine the appropriate telescope for exploring the sky. We've rounded up what we think are the best scopes for kids in different age groups, from relatively simple telescopes for preschoolers and kindergartners, to more advanced instruments for young stargazers in middle school and up. Note: Parental supervision is suggested for small children playing with telescopes. To avoid serious eye injuries and to prevent fires, NEVER allow children to point any telescope or binoculars at the sun. Building a relationship with a scientific tool is easy if it talks to you! Educational Insights' combo telescope and slide viewer lets young kids engage with the wider world. Perfect for the youngest stargazers you know, the Talking Telescope is a combination telescope and slide viewer, with an audio function that delivers facts and questions about the objects on the slides (including things like animals and planets). The 4x-magnification telescope has a wide eyepiece and doesn't need to be focused to magnify nearby objects, so it's easy for youngsters to use. The telescope attaches magnetically to a wide, sturdy base that includes the slide viewer. This toy comes with 20 slides, but unfortunately, there are no additional slides available for purchase. It takes four AA batteries that are not included. The toy is stable and fairly durable. The maker's website recommends the toy for ages 5 to 8, but we think kids as young as 3 will enjoy it. From the infinitely celestial to the infinitesimal, Bresser's Argo transforming instrument encourages kids to explore their universe. The Argo 50mm is a simplified version of "grown-up" telescopes, and we think that makes it a great tool for introducing young kids to these instruments. With a somewhat low magnification (15x) and a simple spotting tool, kids can learn how to identify distant objects and focus the telescope on those sights. It's great for moon and terrestrial viewing. (However, objects appear upside down.) The telescope has an optional second eyepiece (like binoculars), so young kids don't have to close one eye to see through the scope. As a bonus, if kids want to look at more impressive celestial objects and other scientific images, they can use the Argo's microscope attachment. This allows them to view slides featuring things like onion skin, as well as a few images of galaxies. The kit also comes with tools to make your own slides. Setup and operation will likely require the help of an adult (or someone over age 6, at least). To transform the kit from a telescope to a microscope, just slide the attachment onto the end of the telescope tube. The kit comes with a small tabletop tripod and a floor tripod. Extremely easy operation and remarkably good optical quality at a very low price make this surprising telescope a great choice to help kids bond with the night sky. If you have patience and a dark location, then planets, nebulas, star clusters, several galaxies and occasional comets are in range of this telescope. And the optional dark, anti-glare filter provides a spectacular view of the moon! To operate this telescope, just insert one of two eyepieces (20mm or 4mm) for wide and close-up views. FirstScope's 3-inch (76mm) aperture is small, but the telescope's fast focal ratio (3.95) gives kids a view of objects in the deep sky on dark (moonless) nights. The scope can pull in nearly 120x more light than a child's eye, so he or she can catch the photons of the Andromeda galaxy if the sky is dark enough. The telescope reaches a maximum useful magnification of 180x; a young observer can resolve the rings of Saturn and prospect the canyons of the moon. Note that, for terrestrial viewing, objects will appear upside down, which can be fun for kids (and might teach them a lesson about how optics work). The scope weighs less than 5 lbs. (2.3 kilograms), so it can easily be taken along on trips to remote stargazing locations. (It does not include a tripod, so a stable outdoor table is needed.) This telescope also comes with a red-dot "StarPointer" that makes it easier to find and focus on targets (battery included, easy to calibrate). The optical tube is decorated with the names of noteworthy astronomers throughout history, inspiring kids even when the instrument is sitting on their desks or shelves indoors. An optional accessory kit adds a true finder-scope, anti-glare moon filter, two more eyepieces and a DVD-ROM of very useful astronomy software ("The Sky X") for PC and Mac. A surprisingly good telescope, dressed up in kid-attractive livery, Orion's Astro Dazzle is tough enough to last for many years of observing, with high enough quality to make them all enjoyable. Sticking with the tabletop form factor, but bouncing up to a bigger aperture, better-quality optics and a tougher telescope for lots of fun nights to come, Orion offers the Astro Dazzle 4.5-inch Table-Top reflector telescope. The dazzling begins even before you look through the eyepiece. Colorful pictures of celestial objects adorn the optical tube. Except for the moon, what you'll see in the eyepiece will be way less colorful — and a whole lot smaller — than what's pictured. These decorations depart from a long-standing Orion policy of conservative imagery on packaging. Faced with an onslaught of marketing hype from competitors, Orion has apparently become less concerned with accuracy. We can't blame the company for using flashy decorations; no one can expect to get the Hubble Space Telescope for around $130. What you can get, though, is a very good Newtonian reflector. The highly decorated tube has a 4.5 inch (114 mm) parabolic primary mirror at the bottom, cast of soda-lime plate glass, coated with aluminum and silicon dioxide, and brought to a nice polish. This means the telescope – with a focal ratio of f/4.4 – is what's known as "fast." That’s a term borrowed from photography that means the instrument gathers more light than a "slow" telescope of the same aperture. It's going to funnel a lot of photons to your young astronomer's eye, providing a truly immersive, "space-walking" experience. This is a noble bundle. The travel of the rack and pinion focuser feels silky from end to end. The 30-mm secondary mirror is bright and obstructs very little of the optical path (approximately 7 percent of the area). The tube is made of steel; thin enough to equilibrate to ambient temperature for stable viewing, yet strong enough to last for decades. The pivoting tabletop mount is simple, sturdy and solid, providing up/down-left/right "altitude azimuth" pointing. A red-dot finder gets your youthful observer easily locked on target. Bedecked with celestial images (that were actually taken with much larger telescopes) Orion's Astro Dazzle 4.5 comes ready to rock and pivot on its sturdy table-top altitude-azimuth mount. The only corner Orion cut is in the eyepiece selection, and even that is a matter of opinion. To help keep the price within range of gift buyers' budgets, Orion ships the Astro Dazzle with two Kellner-design eyepieces: a 25-mm piece, which will produce 20x magnification, and a 10-mm one, which takes the telescope up to 50x. Kellner uses a three-element optical path, meaning it employs three lenses. The more costly Plossl optical-design eyepieces, which ship with most of Orion's upmarket telescopes, add an extra element, for four lenses in total. The two eyepiece types are equally sharp in the center of the visual field. But as your eye wanders out toward the edges, the Kellner's focus falls off. You'll notice it when comparing low-power (25 mm) eyepieces and observing a star cluster or galaxy, but probably not when stepping up to the high power (10 mm) to examine, say, Jupiter or Saturn. Most of your attention will be on the planet in the center of the field. Here, the Kellner might even be a bit brighter, because the sunlight reflected off the planet has fewer pieces of glass through which to pass. With no onboard motor drive, your fledgling astrophotographer won't be able to take the long exposures needed to capture objects like galaxies in the deep sky. But the user could certainly shoot the moon — and perhaps the brighter planets — with a smartphone camera. Orion's Astro Dazzle reflector is an investment in fun, learning and inspiration that will long outlast the user's "kid years." MTB3 stands for microscope, telescope and binoculars. You get kid-size versions of all three, plus many helpful accessories,with the LabZZ MTB3 combo kit from Levenhuk. The components are plastic and won't stand up to very rough treatment, but you get a lot of science excitement for the price. The refractor telescope's 2-inch aperture is small. But Galileo invented the science of astronomy with something not much larger. While this telescope won't haul in the dim photons of galaxies, it will offer your child a captivating view of the moon and reveal the colors of Mars, Jupiter, Venus and Saturn. The included mirror diagonal lets your young observer watch animals, sports and other terrestrial phenomena "right-side-up." The microscope kit provides a field biologist experience in miniature. It's portable, with a battery-powered light-source. Young scientists can rotate among three objective lenses: 150x, 450x and 900x. To help kids make their own transparent nature slides, Levenhuk includes blank glass with covers, labels, a flask, a spatula and forceps. There are some potential eye-pokers among the parts. Younger kids will need supervision to handle the scalpel, dissecting needle and pipette. Last in the pack, you'll find a set of truly useful, if low-magnification, binoculars. They're sized to fit younger hands and faces. The optical glass lenses are anti-glare coated and will produce 6x magnification. Kids 10 and older are likely ready for a telescope that is a bit more advanced than a tabletop instrument. With proper instruction on safety and instrument care, older kids should be able to operate these scopes independently. Adults may want to stick around to enjoy the view. With a classic Newtonian optical design and seven magnification options, GeoSafari's Omega will empower your older kid to "get out there among the stars." For older kids ready to get an introduction to advanced night-sky viewing, the GeoSafari Omega Reflector Telescope from Educational Insights is a fantastic choice. With three eyepieces and a 3x Barlow lens, this 76-mm (3 inches) reflector telescope has seven magnification options that range from 35x to 300x. It also includes an image erector, which makes images appear right-side-up, for terrestrial viewing. Setup for this telescope takes about an hour, and includes putting together the tripod, attaching the spotting scope, and getting familiar with the eyepieces and other attachments. Parental supervision or assistance is recommended. Note that reflector telescopes like this one are built into a tube that is open to the air at one end. The mirrors inside may collect dust. This is usually not a problem until the mirrors get very dirty. Such pieces can be easily cleaned, as long as you take care to avoid knocking them out of alignment, or "collimation." A little bit of dust is OK and will not compromise the view. Celestron's Astro Fi 90refractor is a compact, easy-to-use telescope. Kids can control it with a smartphone or portable tablet. Just open the SkyPortal app, hold it to the sky, tap an object, and your Astro Fi scope will point there and track the celestial sight. If there's one thing kids today know how to handle, it's a smartphone app. Wouldn't it be great if someone built a telescope to leverage all that app-driving skill? May we introduce your kids to Celestron's Astro Fi 90mm WiFi Refractor and it's sibling, the Astro Fi 102mm Maksutov-Cassegrain Hybrid. If you have an older child who's serious about the sky — and you can afford to spend a little more on supporting her or his learning — Celestron's superb optics and solid machining could mean decades of observing. Under control of the Navigator app running on iOS and Android devices, this telescope makes finding rewarding targets easy and inspiring. Both come with eyepieces that allow for magnifications of 36x and 91x, with a highest useful magnification of 213x. The scopes are operated using the Celestron Navigator app (versions available for iPad, iPhone and Android devices), which can automatically locate more than 120,000 night-sky objects. It's a celestial encyclopedia at your fingertips. Users can pick a target from the app, and the telescope will slew itself to bring the target into view. Because of the price investment needed, this telescope requires careful treatment and is too fragile for very young children. Note: Each Astro Fi telescope is designed to create its own wireless connection to link up with your device, even in remote skywatching areas. Setup may require an external power source for the telescope. The refractor weighs a little more than 14 lbs. (6.3 kg); the Mak-Cas hybrid weighs 12.3 lbs (5.6 kg). We searched for telescopes that were durable enough to withstand playtime, could keep youngsters entertained and would ignite curiosity about the cosmos. When testing the telescopes, we looked at each instrument's basic specifications, like magnification and the number of accessories. We also looked at the ease of setup and of use, the quality of the product's construction and design, and whether the telescope could withstand young children playing with it. We found that the telescopes tended to fall into two categories: those made primarily for observing and those geared more toward science and learning. So we picked our favorites in both of those categories and divided our final choices by age group. Our top selections for kids age 6 and under are colorful and fun, but they can also introduce very young children to telescope viewing. The choices for kids age 6 and up offer more complex technology and more challenging science tasks. The selections for age 10 and up can serve as transitions into high-grade telescopes, and are suitable for casual stargazers of all ages. We worked hard to find the best telescopes for kids, and we hope you find one that works for the young astronomer in your life. Celestron: A veteran in the telescope optics business, Celestron has been offering skywatchers quality instruments since the 1960s and, in 1987, developed the first computerized observatory-class telescope (a battery-operated version followed in 1996). Celestron telescopes have flown on a NASA space shuttle, and the company's NexStar SE appeared on the CBS comedy "The Big Bang Theory." In 2014, Celestron unveiled the Cosmos 90GT WiFi Telescope, the first Wi-Fi–operated telescope for amateur astronomy that can be controlled via the Cosmos Celestron Navigator app for iPhone, iPad and Android devices. For more information on Celestron's telescopes, visit: http://www.celestron.com/. Educational Insights: Educational Insights is a Southern California-based company that has focused on developing educational play opportunities for kids for more than 50 years. The company's Nancy B's Science Club Moonscope is part of a wider Nancy B's Science Club line that includes binoculars, a microscope, a chemistry set, a tree diary and even an "aqua scope" for peering underwater to see inside lakes, rivers or other bodies of water. Educational Insights also offers a range of high-quality telescopes under its GeoSafari line. We liked the sheer range of magnification that came with the GeoSafari Omega Reflector Telescope, but several other models are available. For more information on Educational Insights, visit: http://www.educationalinsights.com/. Galileoscope LLC: An alternative option for our Age 6 and Up category, the Galileoscopes offered by Galileoscope LLC are refracting telescopes that allow kids to build instruments similar to the one used by famed Italian astronomer Galileo Galilei. Kids will build scopes literally from the ground up, with no tools needed (except maybe scissors). We built ours in 30 minutes. Astronomers, science educators and optical engineers developed the Galileoscope as an affordable telescope to spur interest in astronomy during the International Year of Light, in 2009. The Galileoscope team offers free online observing guides (updated by year), as well as tips and activity guides. Individuals and organizations can also donate Galileoscopes to teachers and schools around the world. For more information on the Galileoscope, visit: http://galileoscope.org/. Levenhuk:Founded in 2002 to reach underserved students in Central and Eastern Europe, Levenhuk designs and markets microscopes, telescopes, binoculars, sports optics, magnifiers and digital cameras. Supplementary educational materials accompany most Levenhuk products. The company demonstrates its commitment to kids in the quality-to-price ratios of the optics products, and in the depth of experience facilitated by the accessory kits made for fun learning. To see the complete list of Levenhuk's offerings, visit: https://www.levenhuk.com/company/main/#. Learning Resources: Learning Resources makes hardy, kid-oriented science gear, including the Primary Science Big View Telescope, which we listed as an alternative option for kids under age 6. Big View is a no-frills scope for young children that can be used for moon gazing or daytime terrestrial viewing. (Adult supervision is required to keep kids from pointing the telescope at the sun.) Other than a small, tabletop tripod, this colorful and lightweight scope comes with no additional pieces, and no assembly is required. Its 20x magnification is impressive for a telescope designed for kids in this age range, and the large focus-knob is easy to grab and turn. The eyepiece is lined with soft rubber, but the viewing hole is smaller than that on the Talking Telescope. The piece is fairly durable, but watch out for the viewing knob, which can break off. 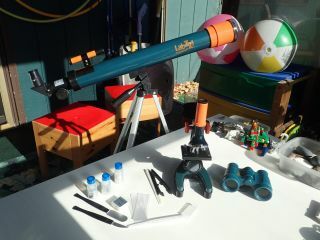 We think this little scope is ideal for studying the moon and terrestrial objects. For more on Learning Resources' products, visit: http://www.learningresources.com/. Meade Instruments: Meade Instruments has been building high-quality optics for telescopes, binoculars and solar telescopes since 1972, and offers a wide variety of instruments. These range from simple refractors like the Infinity 50mm Altazimuth Refractor ($49.95) for beginner skywatchers to ultra-advanced tools like the LX850-ACF Telescope with StarLock ($9,999) for expert astrophotographers. To learn more about Meade telescopes, visit: http://www.meade.com/. Orion: Orion Telescopes & Binoculars has offered a varied selection of optics, observing tools and accessories for amateur astronomers, sports observers and astrophotographers since 1975. The company's instruments range from the beginner level (the Orion FunScope Tabletop Reflector) to high-end tools like the Orion SkyQuest XT8i IntelliScope Dobsonian for more advanced observers. For more information on Orion telescopes, visit: http://www.telescope.com/. Thames & Kosmos: Founded in 2001, Thames & Kosmos provides a wide variety of science- and education-themed kits for kids of all ages. The company offers more than 120 science and experiment kits across 13 different subjects, ranging from astronomy and physics to construction, ignition and alternative energy. While the TK1 Telescope and Astronomy Kit is new for 2015, Thames & Kosmos also has an in-depth Scope Constructor Science Kit that offers a multitude of ways for kids to build their own binoculars, spotting scopes and telescopes. For more on Thames & Kosmos, visit: http://thameskosmos.com/index.html. Follow us @Spacedotcom, Facebook and Google+. Follow this author @DavidSkyBrody.